Videc og Anderson scorer for Manchester United. 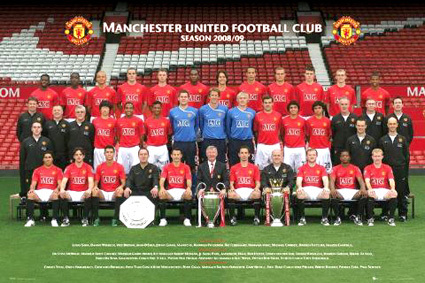 Back row: L Saha, D Walbeck, W Brown, J O'Shea, J Evans, Manucho, R Possebon, R Ferdinand, N Vidic, M Carrick, D Fletcher, F Campbell. Middle row: S McNally (Doctor), A Caveney (Masseur), G Armer (Masseur), JS Park, Anderson, Nani, B Foster, W van der Sar, T Kuszczak, D Gibson, R Da Silva, F Da Silva, E Steele (Coach), N Hough (physiotherapist), A Wylie (Asst Kit Manager), R Swire (physiotherapist), T Strudwick (Fitness Coach). Front row: C Tevez, O Hargreaves, C Ronaldo, R Meulensteen (Coach), R Giggs, Sir Alex Ferguson (Manager), G Neville, M Phelan (Coach), W Rooney, P Evra and P Scholes.